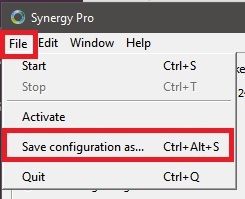 I just bought Synergy pro i've totally no idea how this works but my 3 pc's need to work together at least the file system is there a way to help me with this? Hi TechnicallBrains. It seems that your machine has multiple network adapters enabled as of the moment. It would be best to manually input your server's IP address instead of using the auto config option. allright and how am i supposed to do that into this program ? If i fill in the ip adresses from the other pc's then it won't connect so how do i need to do this ? 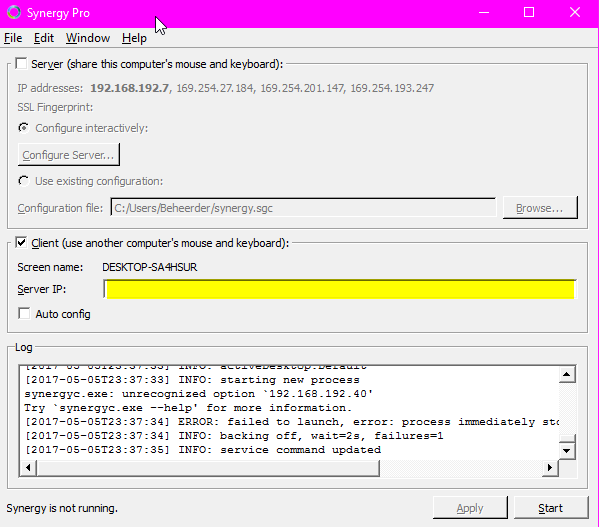 Uncheck the Auto config option and enter the server's IP manually in the box next to it. I see it now. Synergy does not support having special characters for screen names. Please edit the screen name that is set on both the client and the server side. Hi TechnicallBrains. May we ask for your configuration file for all three machines. Follow the steps below to retrieve the configuration file. Please also indicate what screen name each machine is using. Here you got it sorry for the late reaction busy times these days. 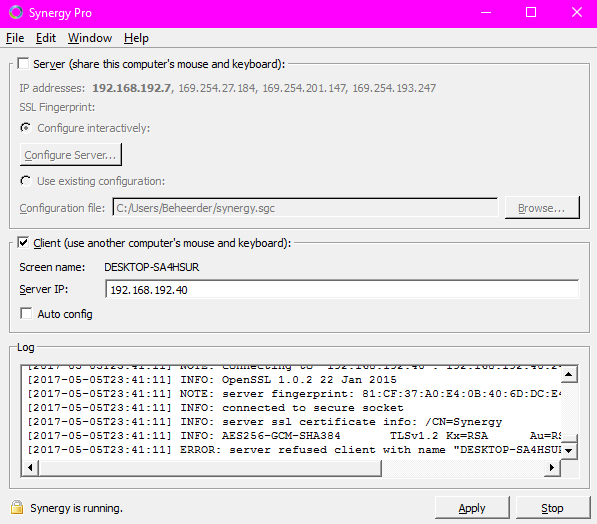 THe name of my Computer with Synenergy is TechnicallBrains the other 2 are TBrainss and TBrains because i guess we need 3 different names ? Hi @TechnicallBrains. Based on that config file you haven't set/configured a screen name for your client yet. 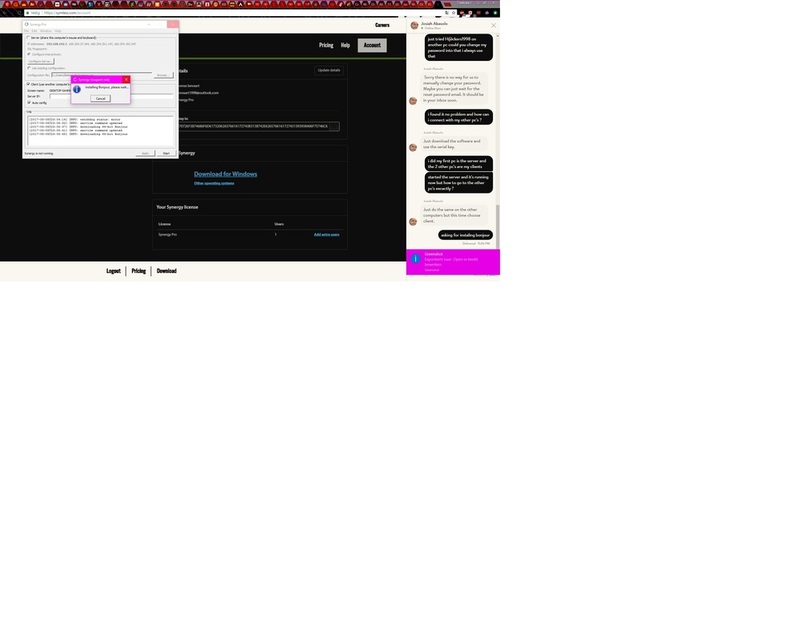 You need to configure both client and server initially as shown on this knowledge base article? You should see the steps on how to add a screen and set a screen name for it that it'll match the screen name you have set for your client machine. I got it from Linus but i never worked with servers like this before so that's why i'm having an difficult time with this i know much about IT that ain't the problem. The most important thing for me is to find a way to share documents or whatever. And like this video discribes it it has to be possible.